Atopic dermatitis (AD) is a multifaceted, chronic, relapsing inflammatory skin disease that is commonly associated with other atopic conditions including food allergies, allergic rhinitis, and asthma. (1) It is the most common skin disease in children, affecting approximately 15% to 20% of children worldwide. Onset of the disease is most common by five years of age, with the highest incidence occurring between three and six months. Early diagnosis and treatment are essential to avoid complications of AD and improve quality of life. Incidence of AD has increase two- to three-fold in industrialized nations since the 1970s, and population-based studies in the United States estimate the prevalence at about 10.7% for children and 7.2% for adults. Twenty percent of children who develop AD before two years of age will have symptoms that persist into childhood and beyond, with 17% having intermittent symptoms by seven years of age. Click Here to Subscribe or Renew! Probiotics are living bacterial or yeast organisms that promote health when consumed. More specifically, a panel of experts convened in 2014 by the International Scientific Association for Probiotics and Prebiotics defined probiotics as “live microorganisms that, when administered in adequate amounts, confer a health benefit on the host.”(2) Most of the scientific and clinical research on probiotics has focused on their oral use for GI and immune health. Oral supplementation and vaginal application of probiotics has also been studied for female genitourinary tract health. Emerging science is currently exploring the use of probiotics in areas such as AD, hypercholesterolemia, anxiety, depression, metabolic syndrome, and autism spectrum disorder. The primary genera that have been used and studied as probiotics are Lactobacillus and Bifidobacterium.2 Other bacterial and yeast species that have been used as probiotics include Streptococcus thermophilus, Saccharomyces boulardii, Lactococcus lactis, and the spore-forming anaerobes Bacillus coagulans and Bacillus subtilis. · Probiotics were effective in reducing total IgE and the reduction was more pronounced with longer follow-up. · Probiotics significantly reduced risk of atopic sensitization when administered prenatally (to mothers) and postnatally (to mothers or infants). · Probiotics did not significantly reduce the incidence of asthma or wheeze. Prenatal and postnatal administration of probiotics has been shown in several randomized, double-blind, placebo-controlled trials (RDBPCT) to significantly reduce the risk of AD in at-risk infants (e.g. those with a parent or sibling with a history of atopy). The first of these trials was published in 2001. (4) The study included 132 pregnant women (recruited with the at-risk profile above) who were randomized to receive either Lactobacillus rhamnosus GG (LGG) (1 billion colony forming units [cfu]/day) or placebo beginning at two to four weeks before delivery and continued through breastfeeding. When breast feeding ceased, infants were given LGG until six months of age. At a two-year follow-up, the incidence of AD was reduced by half in the probiotic group compared to the placebo group. Follow-up data at four years(5) and seven years(6) continued to show a reduced incidence of AD in the probiotic group. Another RDBPCT included 474 mothers who were randomized to one of three groups at 35 weeks gestation and until six months if breastfeeding—Lactobacillus rhamnosus HN001 (6 billion cfu/day), Bifidobacterium animalis subsp. lactis HN019 (9 billion cfu/day), or placebo. (7) Infants were randomized to receive the same treatment from birth to two years. At two years, the incidence of AD was significantly reduced in the L. rhamnosus HN001 group but not the B. lactis group. The reduction in AD incidence in the L. rhamnosus HN001 group continued at four-year(8) and six-year(9) follow-ups. At the six-year follow-up, atopic sensitization was also significantly reduced in children that had taken L. rhamnosus HN001. A 2017 meta-analysis reviewed thirteen studies, and data from 1,070 children (intervention groups, 553; control groups, 517) were assessed. (12) The primary outcome in the majority of studies was the change in the Severity Scoring of Atopic Dermatitis (SCORAD) index. The SCORAD questionnaire includes an assessment of the extent and intensity of the rash, pruritis, and sleep disturbance. Results varied by population studied (European studies were largely negative and Asian studies largely positive) and by the strain or strain combination studied. While the authors conclude that the research to date has not robustly found probiotics beneficial for children with AD, they also suggest that clinical trials with larger samples and greater power are needed to identify species, dose, and treatment duration of probiotics that are most efficacious for treating pediatric AD. A 12-week RDBPCT trial studied the effect of probiotics in children ages 4 to 17 years with moderate AD. (13) The primary outcome was changes in the SCORAD index score, and the secondary outcome was topical steroid use. Fifty-five children (mean age 9.2 years) were randomized to receive a probiotic combination of Bifidobacterium lactis CECT 8145, Bifidobacterium longum CECT 7347, and Lactobacillus casei 9104 (1 billion cfu/day) or placebo. After 12 weeks, the SCORAD index change was -83% compared to -24% in the placebo group (p<0.001). There was also a significant reduction in the use of topical steroids to treat AD flares in the probiotic group compared to the placebo group (p<0.003). In another RDBPCT, 90 children ages one to three years old with moderate to severe AD were treated with either a mixture of Bifidobacterium lactis UABLA-12™ and Lactobacillus acidophilus DDS®-1 (5 billion cfu b.i.d.) or placebo for eight weeks. (14) The primary outcome measure was the percentage change in the Scoring of Atopic Dermatitis (SCORAD) value. Secondary outcome measures included changes in the Infant Dermatitis Quality of Life (IDQOL) and Dermatitis Family Impact (DFI) scores, and frequency of topical corticosteroid use. The IDQOL and DFI questionnaires each included ten questions specific to infant or family activity. At eight weeks, children in the probiotic group showed a greater decrease in the mean [SD] SCORAD score compared to those in the placebo group (−14.2 [9.9] vs. –7.8 [7.7], respectively; p=0.001). IDQOL and DFI scores decreased significantly from baseline by 33% and 35.2% in the probiotic group compared to 19% and 23.8% in the placebo group (p=0.013 and p=0.010), respectively. Use of topical corticosteroids during the eight-week study period averaged 7.7 g less in the probiotic group (p =0.006). Probiotic supplementation holds great promise for the prevention and treatment of AD in infants and children. While a somewhat complicated communication to mothers and parents of at-risk infants, the strongest data to date is prevention of AD with both prenatal and postnatal probiotic supplementation by both mother and infant. While the data to date on the use of probiotics to treat moderate to severe AD remains somewhat equivocal, positive trials to date have shown a significant reduction in SCORAD index as well as use of topical corticosteroids. Factoring in the increased intestinal permeability and food allergies/intolerance in children with AD, probiotics offer a practical addition to the management of pediatric AD. 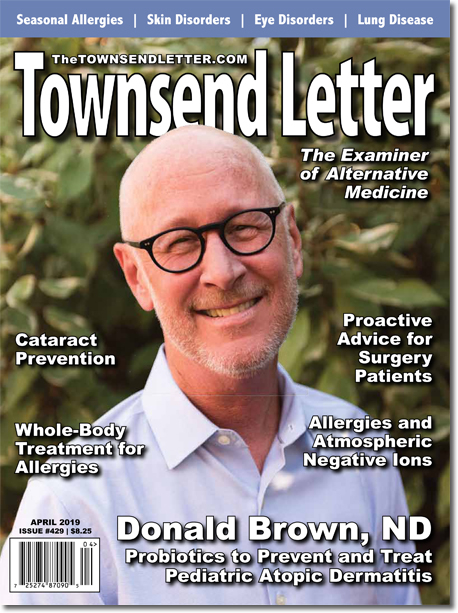 Dr. Donald Brown is one of the leading authorities in the USA on the safety and efficacy of dietary supplements, evidence-based herbal medicine, and probiotics. Dr. Brown currently serves as the director of Natural Product Research Consultants (NPRC) in Seattle, Washington. Dr. Brown is a member of the advisory board of the American Botanical Council (ABC) and the editorial board of The Integrative Medicine Alert. He was a member of the board of directors for the International Probiotics Association (2008-2010) and its scientific advisory board (2006-2008). He has also previously served as an advisor to the Office of Dietary Supplements at the National Institutes of Health. He is the author of Herbal Prescriptions for Health and Healing (Lotus Press, 2002) and was also a contributor to The Natural Pharmacy (Prima Publishing, 2006), the A-Z Guide to Drug-Herb-Vitamin Interactions (Prima Publishing, 2006), and The Textbook of Natural Medicine (Churchill Livingstone, 2006). Support Independent Research and Reporting! 1. Avena-Woods C. Overview of Atopic Dermatitis. Am J Manage Care. 2017;23(Suppl 8):S115 S123. 2. Hill C, et al. Expert consensus document. The International Scientific Association for Probiotics and Prebiotics consensus statement on the scope and appropriate use of the term probiotic. Nat Rev Gastroenterol Hepatol. 2014;11:506-14. 3. Elazab N, et al. Probiotic administration in early life, atopy, and asthma: A meta-analysis of clinical trials. Pediatrics. 2013;132:e666-e676. 4. Kalliomaki M, et al. Probiotics in primary prevention of atopic disease: A randomized placebo-controlled trial. Lancet. 2001;357:1076-9. 5. Kalliomaki M, et al. Probiotics and prevention of atopic disease: 4-year follow-up of a randomized placebo-controlled trial. Lancet. 2003;361:1869-71. 6. Kalliomaki M, et al. Probiotics during the first 7 years of life: A cumulative risk reduction of eczema in a randomized, placebo-controlled trial. J Allergy Clin Immunol. 2007;119:1019-21. 7. Wickens K, et al. A differential effect of 2 probiotics in the prevention of eczema and atopy: A double-blind, randomized, placebo-controlled trial. J Allergy Clin Immunol. 2008;122:788-94. 8. Wickens K, et al. A protective effect of Lactobacillus rhamnosus HN001 against eczema in the first 2 years of life persists to age 4 years. Clin Exp Allergy. 2012;42:1071-9. 9. Wickens K, et al. Early supplementation with Lactobacillus rhamnosus HN001 reduces eczema prelalence to 6 years: does it also reduce atopic sensitization? Clin Exp Allergy. 2013;43:1048-57. 10. Probiotics and Prebiotics. World Gastroenterology Organization Practice Guideline. May, 2008. https://www.evelyntribole.com/uploads/Guidelines-probiotics_prebiotics.WGO.08pdf. 11. Rosenfelt V, et al. Effect of probiotics on gastrointestinal symptoms and small intestinal permeability in children with atopic dermatitis. J Pediatr. 2004;612-616. 12. Huang R, et al. Probiotics for the treatment of atopic dermatitis in children: A systematic review and meta-analysis of randomized controlled trials. Front Cell Infect Microbiol 2017;7:392. doi: 10.3389/fcimb.2017.00392. 13. Navarro-Lopez V, et al. Effect of oral administration of a mixture of probiotic strains on SCORAD index and use of topical steroids in young patients with moderate atopic dermatitis: A randomized clinical trial. JAMA Dermatol 2018;154:37-43. 14. Gerasimov SV, et al. Probiotic supplementation reduces atopic dermatitis in preschool children: A randomized, double-blind, placebo-controlled, clinical trial. Am J Clin Dermatol. 2010;11:351-61.